Nearest: Tube Station: Tottenham Court Road 246 yards (224 metres), Railway Station: London Charing Cross 0.7 miles (1.1 km), DLR Station: Tower Gateway 2.4 miles (3.8 km), Motorway: M1 Junction 1 5.8 miles (9.3 km). Within a 0.5 miles (0.8 km) circle of the hotel are 7 tube stations (underground system). The Radisson Blun Bloomsbury Street London is located close to the West End of London and the Tottenham Court Road end of Oxford street. From here its walking distance to Leicester Square and Covent Garden with its buskers, pubs, cafes and shops. This is a convenient location if access to the City of London is important being on the edge of Holborn. Bloomsbury Street is a busy road during the day, less so at weekends. The big plus for this location that you do have the option of walking to most of the best known areas within central London or taking taxi which are always plentiful in this area. Nearest attractions include British Museum (0.1 miles), Ben Uri Art Society and London Jewish Museum of Art (0.3 miles), Pollocks Toy Museum (0.4 miles), Conway hall (0.4 miles), London Transport Museum (0.4 miles) and Sir John Soames Museum (0.4 miles). The Radisson Blu Bloomsbury Street Hotel is a 4 star deluxe hotel. The guest rooms are beautifully appointed with a contemporary and elegant style. The décor is reflects the Edwardian heritage with its rich fabrics complemented by calming, muted shades and plush, tactile fabrics. The tiled bathrooms are also elegantly appointed with luxurious toiletries and elegant fixtures. Secure access to the bedroom floors is by room key only. All bedrooms feature flat screen satellite TV with PPV movies, Analogue and digital dual line telephone, tea/coffee facilities, us sockets, minibar, safe, iron/ironing board, trouser press and complimentary WiFi internet access. All rooms en-suite with power showers and finished in Sicilian marble. Deluxe rooms have more space than standard. Rooms on the executive seventh floor are specially featured deluxe and studio suites and number just eleven in total. This floor can only be accessed by guests with a 7th floor keycard. Each room has upgraded amenities which include espresso machines, clothes steamers, boutique bathroom gift set, complimentary movies and music, free WiFi and drinks from the minibar. Room service operates 24/7 for all bedrooms. Guests can enjoy fine dining in a cool and intimate atmosphere at the stylish Bloomsbury Street Bar & Restaurant serving the best in British seasonal cooking. Natural, earthy tones help give the setting a laid back and cosy feel. Enjoy brunch or morning coffee, working lunch, dinner, drinks and cocktails. Open: 07.00 till 10.30 (weekends 7.30 till 11.00), 12.30 till 14.30, 17.30 till 22.30 (closed weekends). Reception is 24 hours and provides currency exchange services. Valet laundry available. Concierge and luggage storage services. Hotel business centre provides Internet access, computer workstation, fax and photocopy services. The Bloomsbury Street hotel has 7 function rooms with capacity for up to 400 guests. The hotel also has its own fitness room. Radisson Blu Kenilworth Hotel: is 82 yards (74 metres) away, has a guest satisfaction score of 82% and rates start from about £100. Radisson Blu Mercer Street Hotel: is 392 yards (358 metres) from here, earns a customer rating of 89% and base rates begin at about £175. Radisson Blu Hampshire Hotel: 0.5 miles (0.8 km), rated at 89% and with rates from around £155. Another to Consider: Also close by and a similar hotel (0.1 miles, 0.1 km) would be the 4 star Bloomsbury Hotel, whose lowest rates start at about £189 and which has a 90% guest satisfaction rating. The Bloomsbury Hotel also offers: free WiFi. We can also point you towards a lower price option, the Radisson Blu Kenilworth Hotel. 0.0 miles from the Radisson Blu Bloomsbury Street Hotel (0.1 km), achieving a rating of 82% by its past clients with base rates starting at about £120 (theres free WiFi too). Prefer a tried and tested hotel close by judged by its guests ratings? We think the 4 Star Montague On The Gardens Hotel stands out in that regard. The Montague On The Gardens Hotel is only 0.2 miles (0.4 km) away. The Montague On The Gardens Hotel has an extremely high guest rating of 98%, one of the best rated London hotels. 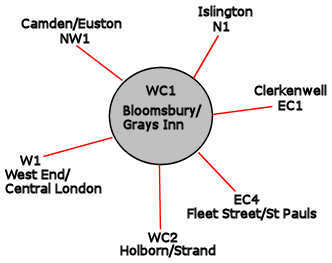 The closest fifty hotels around this area (9-13 Bloomsbury Street, WC1 postcode) that are listed on this website cover a 0.5 miles (0.8 km) radius. The numbers for each star rating are 10 five star hotels (average rating 90%), 24 four star hotels (average rating 85%), 13 three star hotels (average rating 78%), 2 two star hotels (average rating 75%) and 1 one star hotel (rated 46%). The highest rating goes to Montague On The Gardens Hotel (4 star), the Covent Garden Hotel (5 star) and also the Soho Hotel (5 star) (all joint top with 99%). Base Rates: Here we breakdown the starting rates (base rates) by overall average and by star rating. However base rates do not take account of special offers and one off deals so are just a guide. If we look at the average for all hotels in the area (nearest 50) we get an average base rate of £140 per night. The lowest rates are at £18 at SoHostel (2 Star, 80%) and highest base rates of £363 at Rosewood London Hotel (5 Star, 98%). Averages for each sector of star rating: Five Star average: £262, Four Star average: £130, Three Star average: £89, Two Star average: £38 and One Star average: £55. We rank hotels based on our own proprietary algorithm based mainly on guest ratings but adjusted for influencing factors. We rank Radisson Blu Bloomsbury Street Hotel 22nd (joint) of the 50 local hotels and 12th (joint) for the 24 four star hotels in the area. The hotel is 29th of 50 (13th of 24 four star hotels.) for lowest standard rates locally. Looking at the hotels rates plus its user rating we rank it 34th of 45 for sheer bang for buck (SoHostel was top).